We have around 126 routines and we can remember almost everything, I mean it can be hard to remember what number 10 looks like but you know I try to save it. These days when you think of Beyoncé performing alongside two striking artists it’s not Kelly Rowland and Michelle Williams that come to mind first, it’s Les Twins. 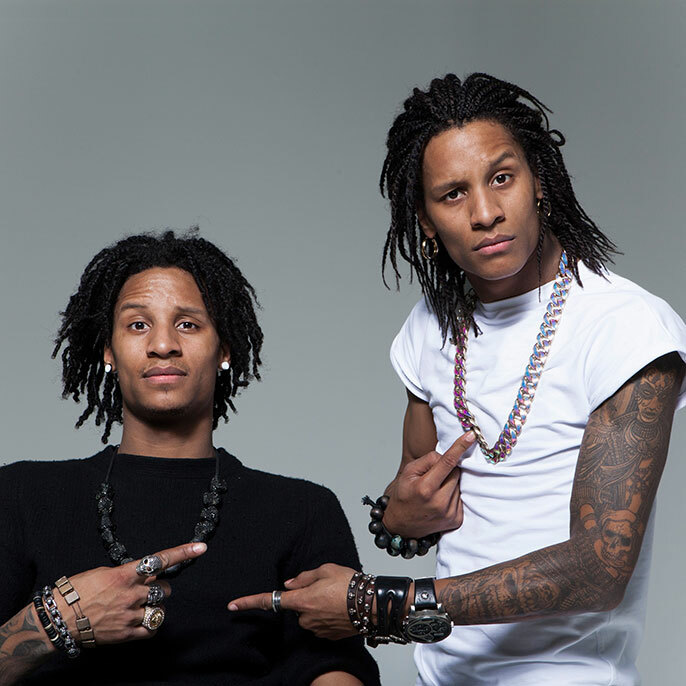 Les Twins is the stage name of identical twins Larry and Laurent Bourgeois. Born to a large Guadeloupian family in a suburb of Paris the twins rose to fame on the French equivalent of Britain’s Got Talent. Since then they have walked for Jean Paul Gautier at Paris Fashion Week, choreographed for numerous artists and graced dozens of covers and television screens. It’s easy to become enamoured by them. Besides their prodigious talent and obvious good looks, their Parisian drawl, inflected with LA and the islands, is assured and appealing. They’re warm and thoughtful in their answers and quick to credit their mum for their success (“my parents were my mum, my mum did both jobs – mum and dad”). But its obvious that the relationship that has catapulted them from YouTube stars to headliners is the one they share with each other. 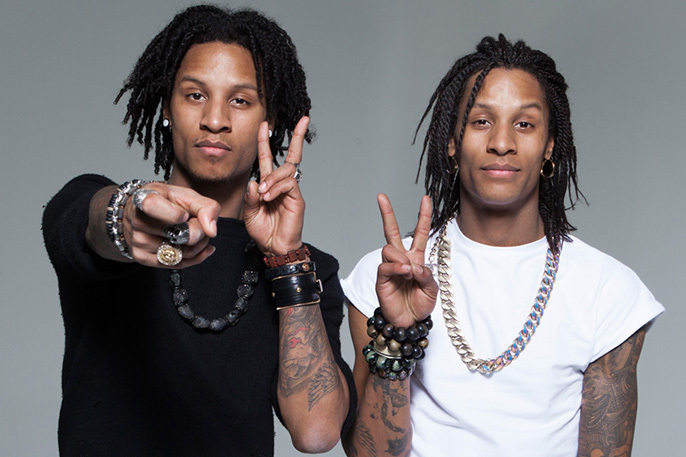 Several times during our conversation each twin refers to himself in the plural Les Twins. At first I think it’s a translation (Larry learned to speak English just two years ago and it’s near perfect) or maybe their artistic temperament. But as we talk they seem to anticipate each other’s words much like they anticipate each other’s moves. So apparent is their symbiosis, by the end of the conversation I am surprised by how infrequently they interchange ‘I’ and ‘we.’ They talk to me about their twin telepathy, finding inspiration in unexpected places and ‘French kissing’ Beyoncé. You’ve said before that ‘you’re not just dancers,’ and that what you do is more than ‘dance.’ How best would you describe what you do? Laurent: We are dancers but I don’t call myself this. It’s more like I’m an artist like Jean Michel Basquiat and so many people that are trying to push the game as far as possible. We entertain but we love creating new stuff, we like opening doors for people that don’t know what dance means, or how dance can be art. We try to elevate the movement… to make the world understand dance can be an art, or a sport, a big beautiful job, or a life. You’re black skinned, so you [must] remember how many times your mum probably said, singing, sport, rapping dancing are not jobs, they are just a hobby? We’re trying to make this a job, a real job for everyone - starting from school. With that upbringing, and no professional training, what led you and your other siblings to become dancers? Larry: We didn’t fit in this world knowing everything like kids do [now], where they cannot get away from TV or this and that, no. My mum, she’s really strict, and there were a lot of rules at home. I didn’t grow up with that technical side or grow up watching video clips so I could copy someone, otherwise I would be just like everyone else. My eyes were for my brother and his eyes were for me. We were never like ‘oh we’re dancers;’ it was so natural. We were always home and dancing crazy because we thought it was natural to physically speak with our bodies. When we came out it was so strange to see that people don’t dance the way we dance! It was like oh my God, really guys, you people don’t dance in your families? Everyone dances in my family so it never started like ‘professional dancing’ nothing like, oh here’s the right music to dance to. No we would dance to any, any, any thing. Sometimes even the music is just in your mind and you can’t do anything else but dance. That’s just how it is. But other dancers did influence you; you’ve frequently cited Michael Jackson as a major inspiration? Larry: If I can just tell you what’s up with Michael Jackson. Michael Jackson, I was not a fan of Michael Jackson, you cannot be a fan of the one. He was like your brother or your dad, part of your family – I cannot be a fan of my dad, no. I didn’t look at any steps of his, because we didn’t have a TV before. When we saw his face and I couldn’t believe that when I’m dancing I do the same thing. It was kind of like my third twin (laughs), so it’s funny… I grew up with Michael’s face but no videos just the image, because I had a little tape of him. I was dancing to his songs without knowing what he was saying so I just had to feel it. Because I learned English just two years go. We don’t look at dancers for steps and do like dancers; we have inspiration from all creative things. Jackie Chan is one of my other big inspirations because no one can beat Jackie Chan; behind him I would put Bruce Lee. Fight for us is like dance so we appreciate it - any moves the body can do. Jim Carrey has this spark, his own way to make people laugh, and he is unique. Its how it is. Don’t, if you’re an actor, ever try to think like Jim Carrey, he is Jim Carrey. You need to create your own spark to be better than him. You’re known for your ability to anticipate and finish each other’s moves. How did that develop? Laurent: We don’t plan anything like that. We don’t know what it looks like, sometimes we see the video and we don’t know what’s happening. When I start freestyling I don’t know what my brother’s going to do because I don’t even know what I’m going to do on stage. As soon as I’m out, I’m there to prove to my brother that he’s a piece of s*** and for him too. It’s all about something people don’t wanna f*** with called telepathy. We have this thing to look at each other and talk without saying words. The time you think only two seconds [has passed] we’ve already talked for ten minutes and that hurts the mind a lot. It happens only when we dance, and that’s a big problem because when we get off the stage we have a headache like you’ve never seen. It’s happened three times. I feel something come out of my body and I have no control and I still keep going and my brother does exactly the same thing. Yet we’ve never done that before – no choreography, no practice, no anything. When we get off the stage we just look like normal but when we get to bathroom start to put some water on the face because it’s too much. We’ve been through a lot of things with Beyoncé on the stage, believe me, but nobody knows. Every time someone f***s something up we just look at each other and do something crazy [to cover it up]. What about individually, what would you say are your distinct individual strengths or styles? Larry: Laurent, the thing that he does better than I do is shut his mouth. I love to provoke people into things but he’s the one that can like step up in front and do it. You know people talk too much, but never ‘do?’ That’s not him. You won’t believe what you saw him do in the video, people will say that’s not real, that’s not possible. He’s crazy - what you see in the video is what he can bring in real life but people still don’t believe it. That is his art. It’s a big relationship I have with my twin; we have to work together. There is no point to work alone. We saw the power that we have together. We did try alone, it can be rap, singing, dance, jokes, days out, shopping – nothing, no magic. He still has something by himself, he’s good, and I’m good by myself too. We have to live alone sometimes but I feel a little some type of way when he’s not so much around me. We’ve spent 26 years together and we’re together now. How do you work together, what’s your creative process? Larry: We fight. We fight and it gets better and better, until we start to understand each other and it gets good. I offer some better ideas to my brother but he never believes, and he gives me ideas and I’m a bit pissed. Then he gives me better ideas, and we keep going like this until we get angry and we keep throwing better and better ideas until he listens (‘that’s not true! That’s such a lie’ Laurent protests). I think we start fighting for a good reason, so we don’t keep a routine – we just have it. We have around 126 routines and we can remember almost everything, I mean it can be hard to remember what number 10 looks like but you know I try to save it. Are there any songs or videos in the past you wish you had choreographed? Laurent: I would never touch Michael Jackson, because he choreographed his own. Every song of Beyoncé's first of all. We thank God we came into each other’s lives. Baby Boy, Bootylicious and Independent Ladies, that last one I would destroy it. And you know why? It was so easy, they did nothing in it because the choreographer was whatever, they didn’t hear music the way we hear the music. But as soon as we met Beyoncé seven years ago and saw how fast she can learn I’m like oh my God, who you work with? They give you baby choreography and you can do so much more than that. Beyoncé famously employs an all female crew, from her band to her photographers. You guys are the exception, why? Larry: We appreciate gifts, and people don’t understand what a gift is. She didn’t work to be Beyoncé. I didn’t work to be Les Twins. Because we are gifted we know how to share it. We are a gift on the stage and I don’t think she feels that way about any other dancers, that’s why she chose us. No one will make her feel like the queen she is on stage. It’s only us that can do that for her. And we got her back. Like you see the way Madonna fell on the stage? If my brother and me were there we would have grabbed her before the first time she fell. I got some views on the way I protect on the stage. We’ve been through a lot of things with Beyoncé on the stage, believe me, but nobody knows. Every time someone f***s something up we just look at each other and do something crazy [to cover it up]. That’s why she just sings for me on my birthday in the face of everyone on earth. You can type on Google Beyoncé sing happy birthday, only two persons appear, Jay Z and Les Twins. It’s funny but I take that as a real gift. I’ve been lucky enough to see Beyoncé perform with and without you in London, and you get that sense of trust. What’s your relationship like? I never do anything like a back up dancer. If I auditioned for Beyoncé I would understand that I’m a back up dancer but I never auditioned in my life. God put me in a position to show Beyoncé why we are the best and stick with her, and keep it up, and grow and just be more mature. And she teaches me every day whatever she got. We have moments with Beyoncé every day, and we the only French guys, so it’s French kissing. American people hug. We’re the only ones coming and saying ‘how you doing mwah mwah let me tell you what it is’ (laughs). We have little moments to say what we have to say, and if I felt bad she will feel it and be like – we will talk later. I don’t call her Beyoncé I call her monster and she knows why. We have the Monster Crew where you have Dr Dre, my brother, me, Beyoncé, Jay Z and Missy Elliot. That’s the Monster Crew right here, people that are really working, not even hard, but someone working more than me, they have to be part of the crew. That’s kind of hard though ‘cause I never sleep, I never sleep. You do seem busy. What is the next big thing for you guys? We love to touch everything. What you saw is only what’s on the Internet, you don’t see what’s most important - all the hard work and all the good stuff behind the camera. Like working with Michael Jackson’s family or making music with Timbaland or for a TV show. My life changes every two days, we already did three Bollywood movies, we’ve choreographed for a lot of rappers, singers here that want to be the next Bey or Jay, we make our own music too, we rap, that’s all coming soon. So what, from all this, can we expect from your performance at this year’s Breakin’ Convention at Sadler’s Wells? Just be there. If you want to stop your life to watch Les Twins video, you won’t grow up. So come over. It’s so different, dance in life and in videos. Its like when you see on TV and you’re like of course they play that, but you don’t believe it. When you’re there the entire studio is like f***.